Nigeria edged Libya 3-2 in a nerve wrecking 2019 AFCON qualifier at the Stade Taïeb Mhiri, Sfax on Tuesday night to go atop the Group E of the qualification table. Following the tension soaked clash against The Mediterranean Knights, Izuchukwu Okosi examines the talking points from the game. 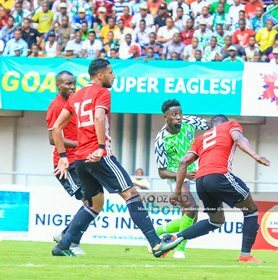 Two early first half goals scored by Odion Ighalo and Ahmed Musa seemed to set the Nigerian side up for another massive win over the same team they embarrassed on Saturday with a 4-0 thumping. But the Libyans read a different script and took the game to their more illustrious opponents. The Nigerian players gave away cheap possession of the ball, and conceded free kicks at dangerous positions. The Eagles were obviously very complacent and it seemed that they got their goals rather 'too early'. Gernot Rohr would have a lot of talking to do in that respect as taking their foot away from the pedal could prove damaging in similar crucial matches in future. Right back Ola Aina had a better performance on Tuesday than that over the weekend but there were instances his decision makings left much to be desired. The Chelsea loanee defended better in the reverse game in Sfax but in the 23rd minute though he was cut out of position upfield but thankfully Wilfred Ndidi came to his aid with a clearance. The Libyans also threatened to score in the 58th minute as they broke from his position. Overall the young man improved tremendously as compared with his efforts on Saturday but still should only be back up for now when the regular one, Shehu Abdullahi is not available. Elche goalkeeper Francis Uzoho is surely a promising goalkeeper, his talents are not in doubt. But the former youth international's performance on Tuesday was not very heartwarming. Uzoho spilled so many balls and had to deal with long range drives. The soon to be 20- year old custodian was even yellow-carded early in the second half for time wasting. The news that emanated after the 4-0 rout was that a big division was brewing between the two factions of the Nigeria Football Supporters Club. However the cheering of the fans almost throughout the Libya versus Nigeria game was encouraging. The Libyans found their voices in their comeback efforts but it was promising to see the Nigerian supporters do their singing and drumming nonetheless. That should be the spirit. Two games, five goals for Odion Jude Ighalo and that is not a feat to be sniffed at. Ighalo's goals against Libya over the two legs especially the back breaking finish which gave the Nigerian side a 3-2 lead were classy and thus showed that his form at the 2018 World Cup was temporary. The Changchun Yatai of China striker has been mouthed by critics after his missed chance against Argentina in Russia but the man proved his talent once again and surely must have exorcised his World Cup demons. He will keep being the Eagles top marksman. Russia 2018 is now consigned to history dear fans. Was he the worst Nigerian striker in front of goal at the World Cup? Nigerian fans should ponder over this subject. Leicester City's Wilfred Ndidi was on rescue mission on Tuesday evening. Several times he covered up for either Ola Aina or the central defensive pair of William Troost Ekong and Leon Balogun. In the 23rd minute of the game, Ola Aina surged forward to support the attacks and lost possession to the nippy Libyans but Ndidi tracked back to help him out. The midfielder also saved Leon Balogun's blushes in the 30th minute when the Brighton and Hove defender slipped and had to clear the ball.